Instead of adding users manually one at a time, you can add many users to a bulk import. To do this, you should create a CSV/XLS file that contains the contacts' data. 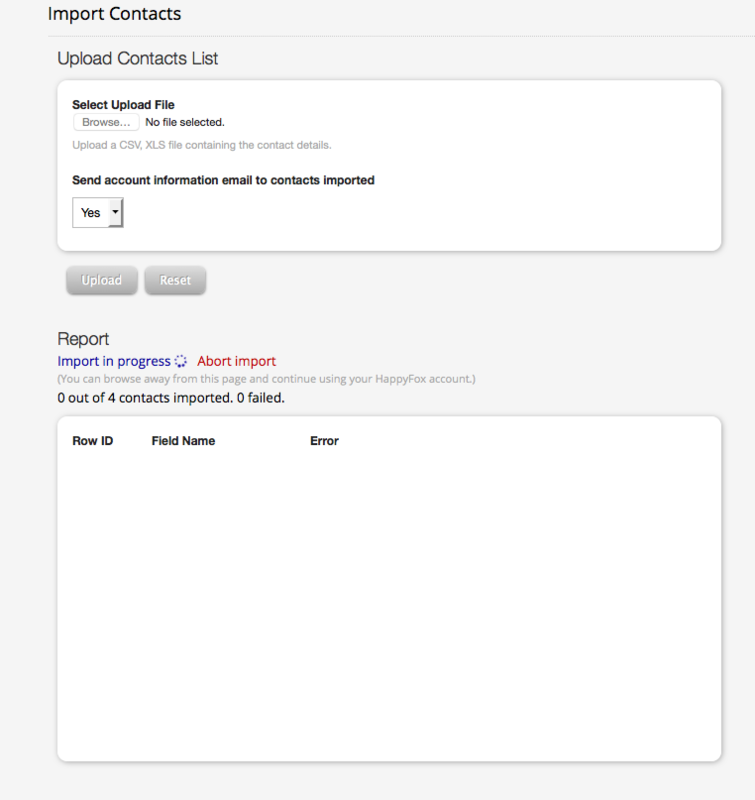 Add contacts to new organizations or replace existing organizations. Only Account administrator will be able to import contacts. If you have a trial account, reach out to support@happyfox.com to enable contact import. Name, Email and Phone numbers: The first row in the file should have the column headings in any order - Name, **Email, and Phone**. This row will be skipped while importing. The records need to be present from the second row. name: 'Name','name','NAME' . Note that HappyFox accepts name as a single field and NOT as two fields (Not as first name and last name). So if your data contains contact name in two columns, combine them into one column and give the column header as any one of Name/name/NAME. Phone numbers that pertain to the account's country (Manage->General->Basic Settings->Country) need not have country code. For other countries, country code is mandatory. For example, if the account's default country is USA, it is not necessary to add +1 to the number, whereas it is necessary to add +91 to an Indian number. Custom Fields: Importing Ticket custom fields of multiple option and drop down types is also possible and this requires you to create the contact custom fields in HappyFox before the import, similar to the fields in import file. Note: Custom fields names are case sensitive. *Contact Group:* The column name of contact group is Contact Group**. A contact can be added to a single contact group or multiple contact groups by comma separated values. Prerequisite! 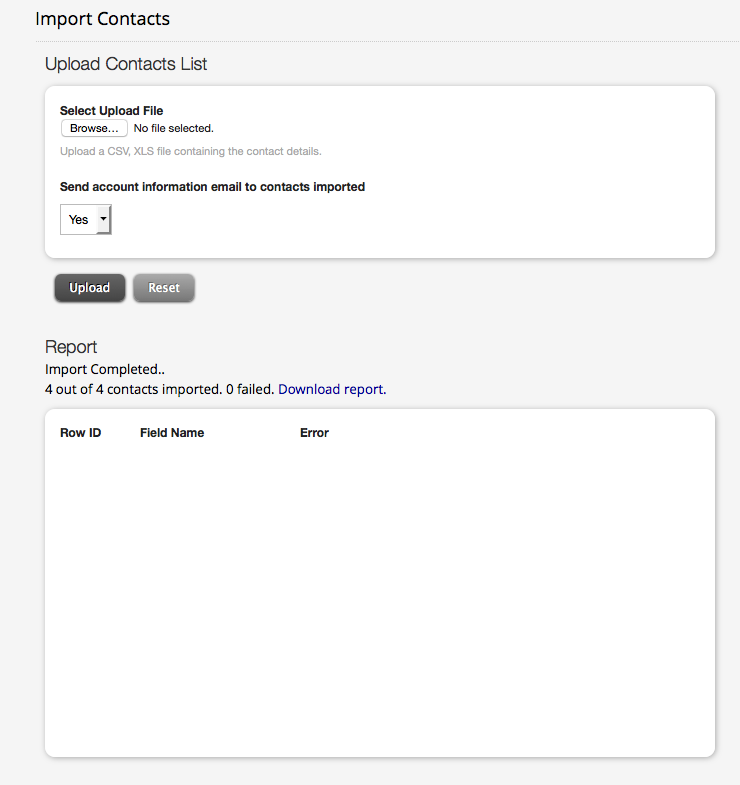 The Contact group should first be created in the account before importing. HappyFox does not auto-create groups during import. Update the existing records: Updating already imported contacts with additional information is done effortlessly as well. Import the updated CSV file with the new or updated records and all the extra fields will be added to the contact fields under each contact. Note: In case of update, even if just one field needs to be changed, all other mandatory fields have to be filled. For more information, please refer to the attached sample CSV file. There are three custom fields in the attachment-Brand, Brand1 Dept and Most Active Days. Brand1 Dept is a dependent drop-down custom field that is displayed if Brand 1 is selected. This has three values- Brand 1 Sales, Brand 1 Support and Brand 1 Enquiries. Most Active Days is multiple select fields which have the days of the week as options in the format "Monday, Tuesday.."
1. Now, login to your account as Account Admin, Go to Contacts from module switcher. Click “Import Contacts” icon on the top right. In Import contacts page, choose the CSV/XLS file to upload and click on "upload". 2. 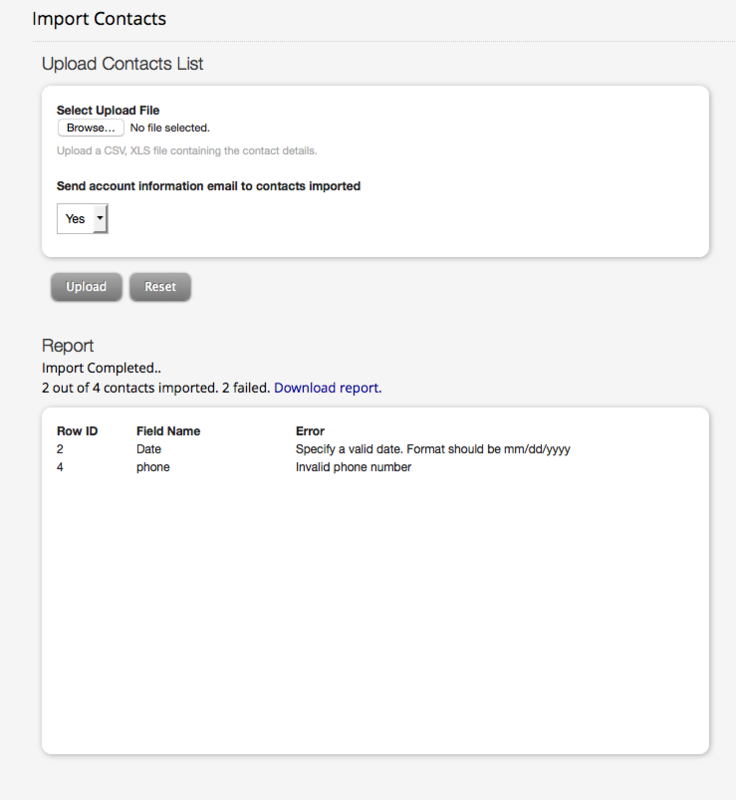 Once the import is completed, reports can be downloaded to see how many contacts are added and how many contacts are updated. 3. To cancel the import process, click on "Abort Import"
Note: Import happens in the sets of 50. For eg: If 75 contacts are imported already, and if you clicked on "Abort Import", then, the system will stop importing contacts once it reaches 100. When there are empty records on mandatory field values or missing field labels or field values separated by a semi-colon and other special characters, error messages are displayed with row IDs and field names that are responsible for this issue to help you fix the issue. Also, ensure that the name of the custom field matches the one in the column of the CSV file. If there is a mismatch, the values won’t be imported. It’s case sensitive and even a typo will derail a successful import.